In recent years, journalists in the United States have been assaulted, bombed, and murdered. Others have had their phones, computers, and records seized by government agents. Online harassment has become a routine part of reporters’ jobs. The current administration has condemned journalists and called for the creation of a state-run television network. Can journalism organizations remain neutral when faced by this type of opposition? What are the primary responsibilities of the free press? To inform the public, encourage civic engagement, advocate against injustice, champion undertold stories? 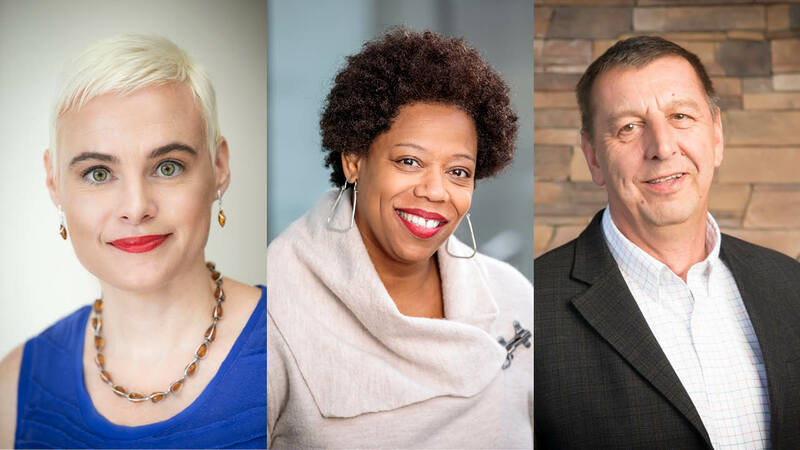 Join us January 23, 2019 at the Alberta Rose Theatre for a conversation on the state of journalism, democracy, and justice with three Pulitzer Prize–finalist reporters: Inara Verzemnieks, Kimberly A.C. Wilson, and Les Zaitz. Think & Drink takes place at the Alberta Rose Theatre, 3000 NE Alberta St., in Portland, from 7:00 to 8:30 p.m. We invite you to stay after the program for snacks and conversation. Minors are welcome when accompanied by an adult. General-admission tickets are $10 to $20. No-cost tickets are available. The event will also be streamed live on this page. All three of our January Think & Drink guests are former staff writers for the Oregonian whose work there and at other newspapers has been recognized by the Pulitzer Prizes. They are also all mentors for Oregon Humanities' Emerging Journalists, Community Stories fellowship program. Inara Verzemnieks teaches nonfiction writing at the University of Iowa. Her memoir, Among the Living and the Dead: A Tale of Exile and Homecoming, was published in 2017. Her work as a feature writer for the Oregonian was recognized by the Pulitzer Prizes. Kimberly A.C. Wilson is director of communications for Meyer Memorial Trust. She has worked as a news reporter and investigative journalist at the Oregonian, the Baltimore Sun, the Seattle Post-Intelligencer, and the Associated Press. Les Zaitz is editor and publisher of the Malheur Enterprise newspaper, based in Vale, Oregon. He has worked in journalism in Oregon as a reporter, editor, and publisher for more than forty years. He recently cofounded the Salem Reporter, an online media outlet covering the Salem area. The 2018–19 Think & Drink series is made possible thanks to the support of the National Endowment for the Humanities, the Oregon Cultural Trust, Stoel Rives LLP, Tonkon Torp LLP, Northwest Natural, and the Kinsman Foundation. Our media sponsors for the 2018–19 series are Bridgeliner and XRAY.fm. Our community partners for this event are the Agora Journalism Center and City Club of Portland. I’m in Southern Oregon, will there possibly be a video or transcript of this Think & Drink available online?